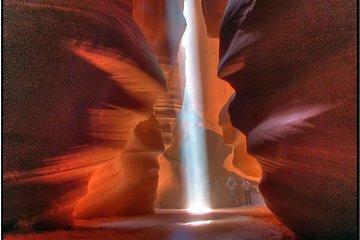 Entdecken Sie die Naturwunder des Antelope Canyon, einer engen Schlucht, die durch Wind und Wasser im Laufe der Jahrhunderte geformt wurde. Ein Navajo-Führer hilft Ihnen, die wechselnden hellen und cremigen Farben der Sandsteinschlucht zu fotografieren, ein Muss in der Pracht des amerikanischen Südwestens. Auf dem Weg von Sedona genießen Sie Blick auf den Glen Dam, den Lake Powell und die Horseshoe Bend. Diese Tour ist eine gute Alternative zum Grand Canyon und zeigt Ihnen mit einem Navajo-Führer mehr über die Landschaft von Arizona. Beginnen Sie Ihre ganztägige Tour mit der Abholung in Ihrem Hotel in Sedona. Die Fahrt zur Navajo Nation führt Sie über den National Scenic Byway durch den Oak Creek Canyon. Auf dem Weg zum Antelope Canyon sehen Sie alte Vulkane und die passend benannten Felsformationen der Painted Desert. Folgen Sie bei der Ankunft einem Navajo-Führer in die engen, gewundenen Sandsteinfelsen der 27 Meter hohen Schlucht, in der das Sonnenlicht in dramatischen Schächten fällt. Sehen Sie zu, wie die Wände der Slot-Schlucht in den Farben Gelb, Orange und Violett beleuchtet werden, und lernen Sie, die lebendige Szene am besten mit der Kamera einzufangen. Sie machen auch einen Stopp beim Cameron Trading Post, wo Künstler aus Zuni, Hopi und Navajo Silberschmuck, Töpferwaren und andere Kunsthandwerker verkaufen. Essen Sie im Glen Dam ein Lunchpaket mit einem majestätischen Blick auf den Lake Powell auf einer Seite und einen Blick in die Tiefen der Glen Dam Gorge auf der anderen Seite. Wandern Sie nach Horseshoe Bend, um von oben einen dramatischen Blick auf den Colorado River zu erhalten, und setzen Sie den Rücktransfer zu Ihrem Hotel fort. Amazing! Allen, our guide/driver from Sedona to Page, was wonderful. He was very personable and knowledgeable; able to answer all our questions. Plenty of stops for bathroom breaks, shopping, and sightseeing. Our second tour guide for the Antelope Canyon portion of the tour was Erwin. He too, was very professional and knowledgeable, and a fabulous photographer who even played the flute for us. The small group tour (13 people) made the trip enjoyable and less hectic. This is definitely a "most do" tour - it is awesome! 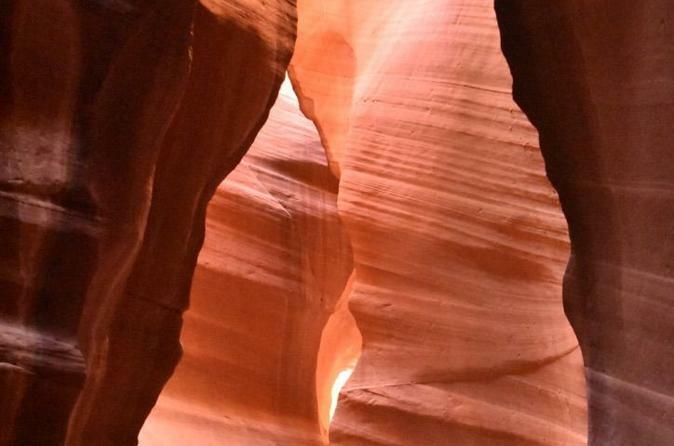 The Antelope Canyon has been on my bucket list for several years and it didn't disappoint. It's an amazing walk through Mother Nature and the beauty of the canyon. The tour guides were very informative and patient. Horseshoe Bend was an added benefit and quite spectacular in it's own right. While Horseshoe Bend was crowded, you could still get some pretty scenic shots, however, Antelope Canyon is packed with people on tours. The tour guide for the trip to/from Sedona was excellent and strongly recommend this company. This canyon is so unique with the formations in the sandstone and sunlight illuminating all of it’s beauty. It looks like a painting on canvas the way the sunlight reflects the waves on the sandstone walls. The Native American guides help to recommend the locations for the perfect picture opportunity. Great sites but guide/ driver Allan made the trip even more memorable. He brought in Native American philosophy. The tour was excellent! Our guide Allen has a great personality and made the 3+ hour trip up to the canyon really fun and enjoyable. He told us about landmarks along the way, history of the area and the reservation. We were on time to every stop and never felt rushed. Worth the money, we’d do it again! We were really looking forward to this excursion, however events beyond control took over. The area had experienced a rain storm a couple of days prior. We started off on our trip and were more than half way there when we learned there had been a terrible incident with a flash flood which collapsed the road. We heard it wouldn't be fixed for a week or so. Disappointed for sure. No ones fault, just a fluke of nature. Our tour guides were fantastic and very knowledgable . Both were native Americans and gave us a greater perspective on the history our Native American ancestry. Antalope canyon was the highlight of the trip and it was very much worth the price we paid. We don’t think we will ever see anything more beautiful this side of heaven. I absolutely loved the horseshoe bend and the canyon. The canyon is so breathtaking. Our guide Leland was awesomeLong day but worth it!!! The entire experience from the scenic drive to the we workout going to Horseshoe Bend was so totally worth it. You go home appreciating the beauty of Gods creation.